How to create a great schedule that will also be accurate enough for the project budget? And are there any templates for the project budget around? Let’s explore the different aspects of a budget, see if there are any templates already available and create a template that you can use. What are common items within a Project Budget to start with? There is of course a high degree of Human resource in most projects and these need to be payed. But there are also machine hours, travel costs, maybe there is additional training needed. And there is the material costs that you might get involved in. How does Project allow you to add these costs in a schedule? For work resources we have the option of setting a hourly rate, overtime rate and even a cost at the start of a assignment. The last one might be tricky to understand, but just think of it as a starting fee for work resources such as taxi’s. They start billing you even before the car starts to move ;-). For expenses such as travel or other reoccurring costs you could create a specific Cost resource. If you add such a resource to a schedule task it will create a assignment that you can provide with costs. Be aware that the cost resources have some specifics to them, described in another post. And if you have one time only costs you could even leave the resources alone and add the costs as “Fixed costs” to the task itself. This is probably the fastest way to add costs, but they aren’t very specific either. But,,, all that being said. These are still just the planned costs, that can change into actuals once progress is reported on tasks. This isn’t really the budget of a project. There is a specific checkbox that you can set for work and cost resources. This changes the resource to a “Budget resource”. This can be very useful, but you need to be aware of some limitations to the budget resource. The most striking one is that the budget resource can only have an assignment on the project summary level. That means that the budget resources only exist on the top level of a schedule. Making it difficult to have a budget for specific parts in the schedule. To counter this you could create budget resources for each time span you would like to have in the schedule. Maybe you want to monitor budgets on a quarterly basis, or maybe on yearly level is enough for you. The difficulty with this approach is how will you set the budget for the year 2017 and let Project know that you only want to see that budget in that year? The main issue I have with all of them is that they aren’t MS Project files/templates. And then there is the “Create a budget” file that you can find using the Office templates in MS Project (I added the file to the OneDrive as well). It’s a great tutorial file and will help you navigate the different parts of a budget as Microsoft sees it. But hardly useful for a wintered PM. If you click on any of the links, be sure to find the report again by selecting a custom report called “Create a Budget”. I created my own Budget template, it’s free to use and available from either the TechNet gallery or you can sign up to the newsletter and get access to the TPC followers OneDrive, which includes this file among other content. The big difference between other project budget template is that I created a yearly and quarterly cost resource. And views that let’s you put in values per year or per quarter for these resources. I suggest you remove the values you will not use (all yearly, or all quarterly) and build your budget accordingly. There are also a “Total budget costs” and a “Total budget work” resource located on the Project summary task. Use the “Total budget, actuals and forcast” view to get a clear picture of the budget. Read the template manual for more information. It’s included in the TechNet gallery and newsletter OneDrive. A light weight Project Server and Project Online solution. It was purchased by Microsoft, but hasn’t made it’s entrance in the tool yet. If you are interested in this app please reach out to Projectum through this page. 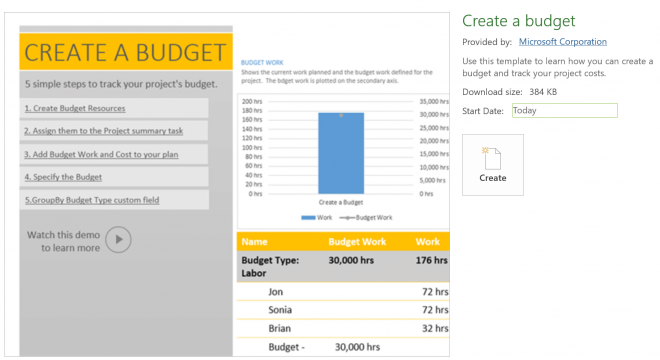 As mentioned on their own site “Add financial management capabilities to Microsoft Project Online”. It’s a heavy and complete financial solution, and can be very powerful if you are willing to spend the time and money of implementing it. Find out more about their tool set on their site. Ben Howard, from Apple park. Nenad Trajkovski has 3 very nice posts. Here, here and here. Dale Howard (not related to Ben), from Sensei Project Solutions. This has been a blast! I liked doing the research on the budget template and searching the valuable content that already exists on the web. And although I didn’t find much on the budget templates in regards to MS Project I liked reading the blog articles from others. And I hope you liked reading mine. If you are looking for more great cost related content how about reading the About cost resource post. It will surely trigger you and provide you with some valuable information. Very useful post. I found so many interesting stuff in your blog. Truly, its a great article. will look forward to read more articles. It’s really great read for me, there many things you have described here which I didn’t focused.